1974 Gordon and Smith Surfboards Bonza 6 ft 8 1/2"
Fibreglassed foam blank, 1/8" cedar stringer, spray. Post production right hand leg rope plug. 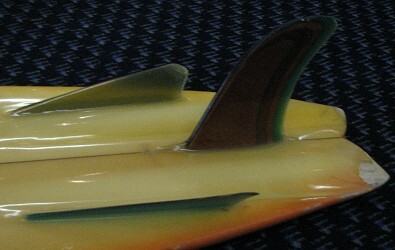 Bottom: single concave at sweet spot , splitting to deep double concaves in front of the fins to the tail. Centre fin : 6 inch x 6'' base x 8'' (span) @ 6''. Deck: Large Gordon and Smith enhanced script, multi coloured in shield with bird borders at centre. Bonza x 2 - towards nose and tail, image below. Bottom: Large Gordon and Smith enhanced script, multi coloured in shield with bird borders at centre. 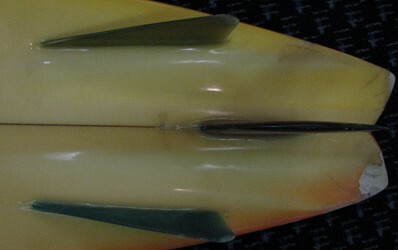 Hand shaped Tubeshooters by Peter Townend and Dolphin, towards the nose, image below. Yellow spray on left rail, Orange spray on right rail, Volan 3/4 deck patch. Yellow spray on left rail, Orange spray on right rail. Dimensions and images thanks to Mick Mock, Surf Auction, November 2011, #52. Peter Townend started his surfing career on the Gold Coast of Queensland with peers Michael Peterson and Rabbit Batholomew. In he mid 1970's he moved to the Cronulla area and produced a range of boards for long term manufacturer, Gordon and Smith Surfboards. 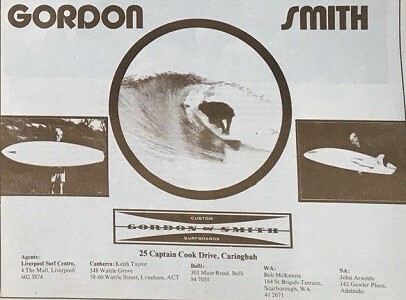 While at Gordon and Smith Surfboards he used/promoted Bonzer designs and asymmetricals and was the sponsored Australian surfer for Hollow Wave boards from the USA.. He was to go on to form the Bronze Aussies with West Australian Ian Cairns, and others (Mark Warren, Cheyne Horan - see # 84 - and Cronulla's Jim Banks). He won the first professional surfing title in 1976, based on points accumulated over a year. He played a main surfing role in the Hollywood production Big Wednesday, 1980? Despite many contest victories and reputable performances in large Hawaiian surf, he was often noted as a constant runner-up or The Shorebreak Kid. # 109 1965 Gordon and Smith, Noserider 9 ft 7"
# 26 1967 Gordon and Smith, Vee Bottom 7 ft 7"
The bottom design has similarities with the shape of Rogallo hang gliders, first designed in the late 1940's as a method of recovering returning space capsules by NASA. F. M. Rogallo predicted in 1949 that "Portable delta wings will give birth to a popular sport"
- quoted in Desfayes (1974) page 41. By the early 1970's, hang-gliding was a sport in rapid transition with a large amount of media exposure. As a sign of the powerful influence of Australia in world surfing at this time, the name Bonzer (also Bonzar, Bonza) is an Australian expression for “excellent”. In late 1973, the Campbell Brothers licensed the design to Bing Surfboards for commercial development. in the development of the Twin fin 1 in 1970. See image and notes, below. The Bing models were noted for the wedged Bonzer decal that was laminated on the side fins. 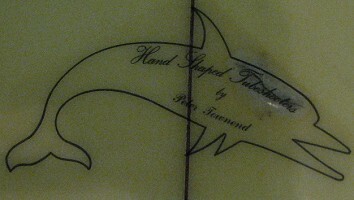 Peter Townend (Gordon and Smith Surfboards). See image below. 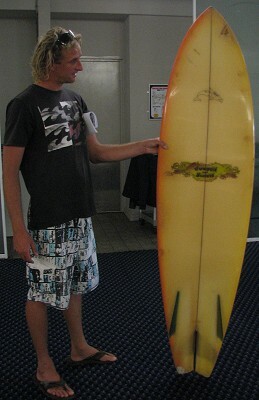 Hawaii and Terry Richardson (Skipp Surfboards). See image below. It was a (admittedly complex) combination of previous design experiments - multiple fins were first used by Tom Blake circa 1940, tail concave by Bob Simmons in 1950, tri-fins by Brewer in 1970, keel fins go back to Blake and were re-introduced on short boards in 1972. 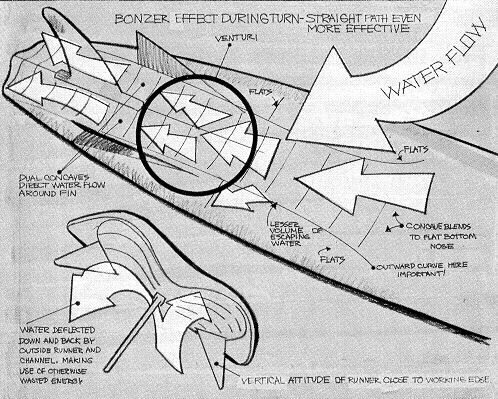 While some commentators have seen the Bonzer as a direct precedent for Simon's Thruster, its influence was probably substantially less significant than Brewer's Tri-fin experiments (that critically noted that placing the rail fins behind the centre fin made it "track", when positioned in front the board was "looser"), MR's Twin fin, McCoy's wide tailed No-Nose design, and of course the direct influence of Frank William's Twin-fin with a small centre trailing fin. I briefly rode a borrowed Bonzer in the mid-1970s, and like my contemporaries, found the board very stiff and with a tendency to hang high in the wave face. A number of my peers actually sanded the keel fins off and thought the board went significantly better. A local manufacturer picked up on this and produced a number of boards with the deep double concaves, but without the side fins, that were well received. In my search for vintage boards, I have come across one example of a Bonzer with the side fins removed, so I assume this was not just a local phenomenon. 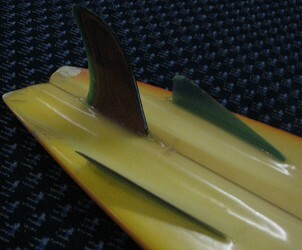 D-Fins) initially credited to Rusty Priessendorfer for Rusty Surfboards (USA). Later identified as another original design by the Campbell Brothers. 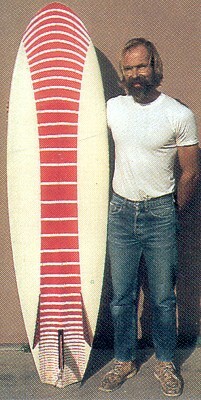 "Mike Eaton of California; responsible for reviving the twin fin. Seen here with his 70's brain child 'the bonzer'." Nat : History (1983), page 108. Seen here with The Bonzer. The Surfers Journal 2004? Volume 13 No. 2 pages? Gordon and Smith Surfboards: PT Bonza. 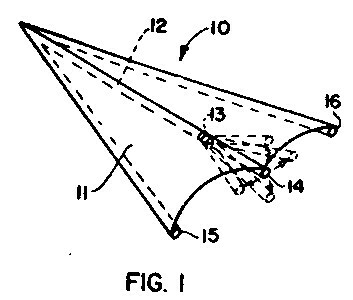 Warshaw, (2005) Bonzer : page 73. Conscripted surfresearch assistant and G&S Bonza. Harbord Diggers Club, November 2011. Peter Townend and G&S Bonza, December 1973. Nat : Fundamentals (1985) page 102. Tracks, January 1976, page 25. Drawer B, Newfoundland, N.J. 07435 circa 1974. Geoff Cater (2011-2018) : Gordon and Smith Surfboards Bonza, 1974.